This past weekend saw the fourth annual Drink Local Wine conference make its mark on Denver. It was also the first public appearance by a new Colorado winery: Ruby Trust Cellars. And how just how did this new upstart fare? Their cabernet franc-based Smuggler (90% cab franc, 5% cab sauv and 5% petit verdot) was voted Best Red Wine by a group of 200 media and consumers. It looks like founders Ray and Jean Bruening are off to a pretty impressive start to their new venture. 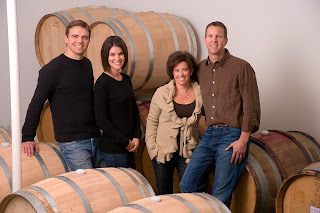 After spending two decades as an options trader on the floor of the New York Mercantile Exchange, Ray and his wife decided to slow things down and focus their passion for wine by crafting premium Colorado wine. They brought in winemaker Braden Dodds, who has made wine in California, Argentina, New Zealand and Australia, to craft a series bold red blends with local fruit. Ruby Trust's first vintage release of approximately 400 cases has already sold out and is on the list of some of Colorado's top restaurants. Judging by the comments I heard from many of the media attendees at the conference, Ruby Trust is going to be force to be reckoned with in the Colorado wine industry. Make sure that you pick up a bottle from this newest award-winning winery on your next trip to the wine shop! And with that, please let me thank Braden Dodds for taking the time to answer the questions in our latest installment of Meet the Winemaker. I studied Enology and Viticulture at Cal Poly State University in San Luis Obispo, California. That's a good question. I have been involved with wine since my freshman year in college so I don't really know where I would be. Probably something dealing with the entertainment industry. I have 11-month-old twin girls right now which seems to be a full time job of its own. I'm not sure there is one variety. I have made a lot of wines around the world and enjoyed each one for different reasons. I think Rhône varieties do well in Colorado and I would like to have access to more of them. Piedmont! Although Nebbiolo, Dolcetto, Barbera and Arneis are grown all over the world they just don't compare to the Piedmontese style. Gorgeous location, fantastic wines and amazing cuisine....tough to beat in my opinion. Wow, not sure I can answer that. That's like asking me who my favorite child is. Modern Jazz- Simple and easy to enjoy but when you dig a little deeper you see how complex and balanced it really is. A great up and coming region known for Syrah, Cabernet Franc and Riesling. What changes would you like to see in the Colorado wine industry in the next 10 years? I'd like to see the quality continue to increase across the board and wineries start to specialize on particular styles or varieties. I think when a small winery (the entire Colorado wine industry is considered a small winery...) tries to make every wine for every consumer they spread themselves thin and have a hard time making the best wines possible. I like Ruby Trust's approach of only making a handful of red blends and doing it well. I like the article I always like seeing wineries going good. There is nothing like entruepunship especially when it comes to brewing. In anyone has any wine questions come check me out at www.winebasic101.com.